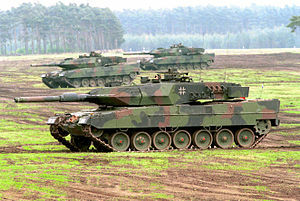 German Leopard 2A5 main battle tank. A main battle tank (MBT), also called a battle tank, is a tank that is used as the most powerful combat vehicle in modern armies. They were made to replace the light, medium and heavy tanks used in World War II with just one tank. Lighter armor made it easier to put bigger guns on tanks without adding weight. Light tanks are still used in places where heavy ones cannot go. MBT's are the main force in ground fights but get help from other combat vehicles and soldiers who travel in infantry combat vehicles. They also get help from observation or attack aircraft. T-72B with thick "Dolly Parton" composite armor on the turret front. Medium tanks were the earliest MBTs. MBTs started replacing medium tanks when guns on medium tanks became powerful enough to win against heavy tanks. Heavy tanks could not carry armor strong enough to win against medium tanks. The nuclear weapon threat and other anti-tank weapons in the Cold War made countries add more protection to survive in all types of combat. Weapon designers made powerful cannons to defeat the armor. 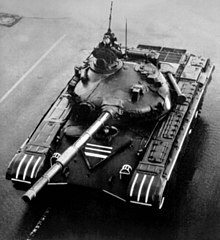 The Soviet Union made MBTs very quickly because it needed them for their type of war. The Soviet Union improved the cannon by replacing the loader crewman with an automatic autoloader. This made the turret smaller which also makes the tank harder to see or hit The Soviet Union made missiles that could be shot much farther than other ammunition. After the Cold War, American tanks quickly defeated Iraqi tanks in the Gulf War. The American MBTs were still not as good as attack helicopters at destroying Iraqi tanks. Some said that the MBTs could not stop an enemy force from attacking. ↑ 3.0 3.1 3.2 Front Cover Thomas W. Zarzecki (2002). Arms diffusion: the spread of military innovations in the international system. Psychology Press. p. 212. ISBN 0-415-93514-8. Retrieved 5 April 2011. ↑ Academic American encyclopedia, Volume 2 (1980). Academic American encyclopedia, Volume 2. Aretê Pub. Co., 1980. p. 177. Retrieved 4 April 2011. ↑ Chris McNab, Hunter Keeter (2008). Tools of violence: guns, tanks and dirty bombs. Osprey Publishing. Retrieved 6 April 2011. This page was last changed on 18 March 2019, at 22:07.